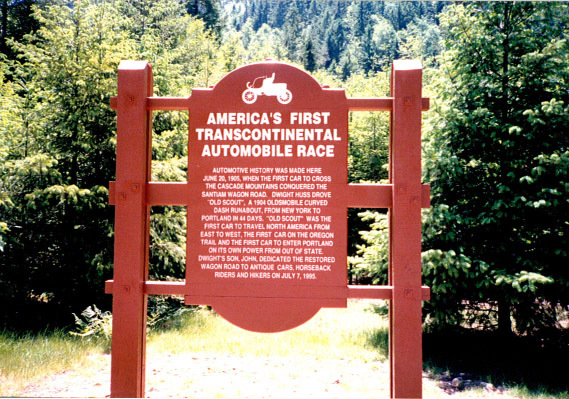 Automotive history was made here June 20, 1905, when the first car to cross the Cascade Mountains conquered the Santiam Wagon Road. Dwight Huss drove “Old Scout,” a 1904 Oldsmobile curved-dash runabout, from New York to Portland in 44 days. “Old Scout” was the first car to travel North America from east to west, the first car on the Oregon Trail and the first car to enter Portland on its own power from out of state. Dwight’s son, John, dedicated the restored wagon road to antique cars, horseback riders and hikers on July7, 1995.